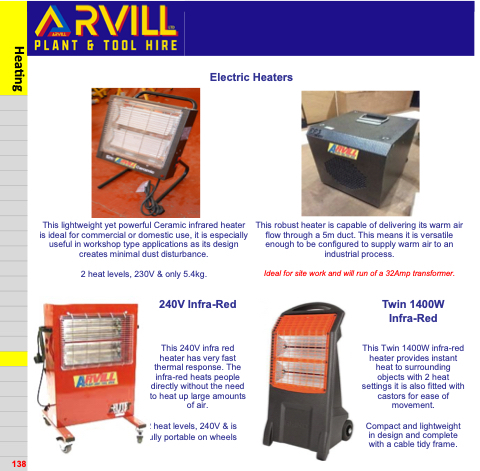 This lightweight yet powerful Ceramic infrared heater is ideal for commercial or domestic use, it is especially useful in workshop type applications as its design creates minimal dust disturbance. 2 heat levels, 230V & only 5.4kg. This 240V infra red heater has very fast thermal response. The infra-red heats people directly without the need to heat up large amounts of air. This robust heater is capable of delivering its warm air flow through a 5m duct. This means it is versatile enough to be configured to supply warm air to an industrial process. Ideal for site work and will run of a 32Amp transformer. This Twin 1400W infra-red heater provides instant heat to surrounding objects with 2 heat settings it is also fitted with castors for ease of movement. Compact and lightweight in design and complete with a cable tidy frame.